I like the word ”beyond”. It refers for me to what I call the Soul: the thing that is no-thing, the stuff that every thing is made of, the unperceivable essence of all there is. Last week I received the first issue of a music magazine with that name. 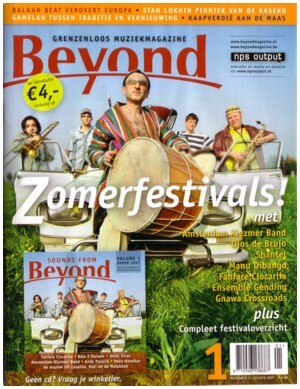 Beyond is about what used to called world music, music from all corners of the world. There will be 8 issues before the end of 2008, and if you subscribe now, you get these for only 30 euro. And that includes the CD’s that come with each issue. I just listened to the CD that came with this first issue, and oh boy, do I love this! I expected much more political correct traditional sounds, not this danceable modern nightclub stuff. It is from exotic places like Addis Abeba, Belize and Bali, but many of the selected songs are floorfillers, made not only with traditional instruments but also with computers. Recently I have heard more of this stuff, on parties, on the radio, and even on the CD’s that I receive in my mail box. From the Balkan, South America and other places that I know nothing of. I never was into the ethno-music that many of my friends started listening to 15 years ago or so. I missed the beat and the dance floor vibes in most of these ethno-songs. But on these free CD are at least four bands that I like so much that I am going to check out if the music on their CD’s is really all that great: Otros Aires, Amsterdam Klezmer Band, Fanfare Ciocarlia and Jaune Toujours. A while ago I wrote about two very recent Bollywood songs, that were played at a party and that made me dance like I haven’t done in times. I still haven’t found out the names of the artists and the songs. If anybody can help me (Milan?! ), please do. I would love to buy these CD’s. Some songs on the Beyond CD have the same flavour. Here is my favourite track from the Beyond CD, Allerdings Otros Aires , by Otros Aires. About the Bollywood tracks, did you hear them that night in Paradiso? Aren’t they featured on the Bombay Connection CD?